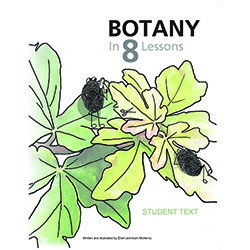 View cart “Botany in 8 Lessons (paperback)” has been added to your cart. 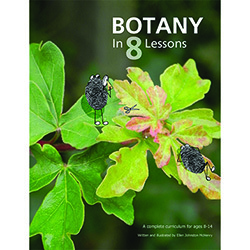 A complete curriculum designed for ages 8-14. Includes both student text and teacher's activity guide. Over 200 pages, color illustrations included. This download gives you the exact same content as the paperback. The only difference is that with the digital download you get it cheaper and faster. (This digital download comes with the audio files, too, so you don’t need to use the separate audio download.) You can make a printed copy of the text, or you can “go green” and read the text on the screen, printing out only the pages necessary for the games. –How long would it take to complete this curriculum? Probably a minimum of 4 to 5 weeks if you really raced through it, and more like 6-8 weeks if you go at a relaxed pace. You could even stretch it to 9 or 10 weeks if you added in other activities (gardening, field trips, etc.) It really depends on how many hours per week you spend on science, and how long you spend on each activity (and whether you watch all the videos). Some students might want to play the games multiple times, or spend extra time on their art activities. You can make this curriculum fit your schedule.